Can anyone with experience of attending the Belgian GP point me in the direction of a good shop for beer on the journey from Calais to Spa? A good shop for beer in Belgium is basically any supermarket in Belgium ! The beer here is amazing and cheap ! I couldn't say where/which city/town to stop en route though tbh. Look for anything with the Trappist label on it and you cannot go wrong. http://www.stpeterslist.com/197/the-7-a ... onk-beers/ may help ! Any tips for the Italian grand prix? About to pull the trigger on laterale destra C on the main straight. I've never been to the Italian grand prix before. Thanks! I'm going to Monza as well, last went in 2010. Don't really have any tips other than look for a place to get onto the track from your seat for after the race, and take your wellies because it's knee-deep in Italian clunge. Wonderful venue so much history Wrote a long post on here last year not sure what page is on. I have been to Silverstone every year since 2009 but last weekend was my first trip abroad to a Grand Prix & the Cathedral of Speed certainly didn’t disappoint! I chose to travel with a racing tour company that took care of all my travel & accommodation so that I only had to enjoy myself. The trip got off to a great start when I spotted Will Buxton on my flight and accosted him at the first opportunity! I am usually quite shy but I was so excited to be going to Monza I just had to shake his hand. I think I gave him a bit of a shock as he had just woken up! Our tour guides go to every grand prix & entertained us on the journey into Monza with anecdotes about drivers & F1 personalities. The drop off & pick up point was at an entrance to the Royal Park very near the circuit. On Friday I wandered around getting to know the track before the crowds arrived. It is much more enclosed than Silverstone & it’s easy to get lost. You go under the track in places & the centre is a crisscross of paths in the woods. After following one I came out of the trees to see the Parabolica spread in front of me – amazing! I watched practice mainly from a covered stand on the main straight as the open stands were too hot for me in the full sun. I was sat opposite the Mercedes garage (I should declare my allegiance to Lewis now…!) with Ferrari’s next door. There was some commotion in the stand nearby & then the Tifosi covered that section with an enormous Ferrari flag. Not to be out done I stood up & waved my Union Jack passionately to the delight and amusement of the Italians around me who were indicating the difference in size. It was a hilarious moment! Saturday gave plenty of action on the track & as the grandstands were filling up I bumped into David Coultard & Johnnie Herbert on the crowded paths behind the stands. Qualifying was exciting & gave us a taste of things to come . I returned to my hotel in Como tired but very happy – my man was on pole! Race day meant an earlier start but it was surprising easy to get to the track. The Tifosi were piling in & it was soon very crowded. The atmosphere was building up and the chanting & cheering were all good humoured. My Union Jack flag did look a bit lonely amongst all the Ferrari ones! As the time for lights out approached the tension rose & I had to pinch myself – was I really here? The race was Monza at its best - fast & furious. I did feel for the Ferrari fans when Alonso went out as it must have been very disappointing. As Lewis took the chequered flag there was plenty of cheering & waving of all sorts of flags. Massa was obviously a popular third. As an older fan I had some reservations about joining the battle to the podium but hey it had to be done! I soon discovered that I could get my elbows out with the best of them & got close enough to get a good view of the podium & nearly smell the champagne - it was just magic. As the fans began to slowly disperse I wandered down the pit straight to pole position just soaking up the atmosphere. Hi, just wondering if anyone could give advice on cheapest/best way to travel to silverstone from Northern Ireland. Considering going next year but not sure if its better to drive, ferry etc or to fly to Birmingham and go from there. We will be camping so probably will have a lot of belongings! Does public transport take you direct to the circuit? Post subject: Going to my first Grand Prix!!! So tomorrow I have my shinkansen tickets from Tokyo to Nagoya and I'll be attending my first Formula One Grand Prix this weekend (I'm a teacher and there was just no way I could get down there for Friday practice). I am so #&$^-ing excited! I know I missed the V-12's and the V-10's (and the V-8's) and I know I missed seeing Schumacher in person, but I am over the moon that I get to see this. I can't thank my wife enough for just telling me least year, "it's just money, you should go." This is last year's birthday, father's day, anniversary, and this year's christmas and next year's birthday present. My six year old is also super-jealous that he has to stay home but we just weren't sure if he would be interested or if after an hour he would look at me and say, "I'm bored, let's go." So he's staying home. I've been lurking on here since I first found this website after moving overseas in 2003 (I'm originally from Seattle, Washington, USA). When I lived in Norway and then the Czech Republic I always wanted to get to a race (almost made it to the Nürburgring a couple of times) but it never happened and now it finally has. I feel like an excited little boy on Christmas morning even though I'm 43. I'll be taking lots of pictures and will post some if I can figure out how to do it after I get back. I'm not sure the point of this thread, I'm just so amazingly excited that I get to go after all of these years of getting up early (when I lived in Seattle), watched it in a foreign language (when I lived in Norway and Prague) or stayed up late watching it on __(redacted as I may have been watching it on a dodgy online stream but I can neither confirm nor deny that fact)___. I'm not trying to gloat or anything. I just want to share my excitement with people who are as crazy for this as I am. Full disclosure: I fell in love with a car on the cover of Car & Driver magazine when I was in the sixth grade. It was 1984 and I later found out it was the Ferrari 288 GTO (still my favorite Ferrari). Then I found out the same company had race cars. At that time in the western USA we only saw Monaco (and maybe a few other races I can't remember) on ABC's wide world of sports. And guess what? Ferrari didn't win at all! I still cheered for "my" red team. I remember 1993 and the focus on Michael Andretti. I remember laughing (sorry) when he crashed out of (was it Monaco?) in the first or second lap. Silly Americans (I'm American, by the way...just found it funny). I remember Senna dying because it was in the news, but still only watched here and there. Fast forward to 1995 and I'm out of college, working in a high school, and getting up early to watch the races. I remember hearing about "some German of dubious sportsmanship" coming to "my" team. I was not happy. Fast forward a few years 1998-99 and I'm cheering this same German on. Needless to say 2000-2004 were great years for me as a fan, but 2006 was a heartbreaker. I still cheer on Ferrari and everyone who races for them (rooting for Alonso was hard for me after 2006) but I am now a fan of the sport. I don't think there is any driver I dislike (took me awhile to warm to Hamilton, especially after he rammed Kimi in the pitlane in Canada). It's so much easier to not be so caught up in the team (I no longer call them "my" team or refer to them as "us" but that might just come from getting older). I now am trying to get my son interested in it (I've bought all the super cool Racing Legos from this last year - they are super cool!) but he has somehow decided that Rosberg is his favorite driver. I just keep thinking 1) Really? and 2) you are going to be so disappointed! But then again, I'm from Seattle and apart from the Sonics in 1979 and the Seahawks 2 years ago our sports teams are terrible (don't even get me started on the Mariners!!!). Sorry for the very long post. I'M JUST SO F-ING EXCITED!!!!!! Forza Ferrari, Forza Seb, Forza Kimi, and Forza Jules! Post subject: Re: Going to my first Grand Prix!!! All I can say is - enjoy it! What a circuit to watch your first GP! I went to my first GP in 2012 (Silverstone) mainly because I had a feeling Schumi would retire at the end of the year so it would be my last chance to see him! I've been a fan since '92 so it took me 20 years to find the spare funds to go, plus growing up I always thought that F1 was out of my reach - how wrong I was!. It's a weird feeling, seeing the cars and drivers on track, in person. Of course, watching on TV gives you so much more info but you can't beat being there and feeling the speed and smelling the brakes and tyres... you're not going to want to leave the circuit! This is last year's birthday, father's day, anniversary, and this year's christmas and next year's birthday present. I think that says it all about the extortionate prices for F1 nowadays. So sad. Have a great day, take the time during practise to move around the track and check different vantage points. Damn man congrats. I envy you. Have a good time, take plenty of pics, then come back here and show us what you have. Lucky! Have a great time. I got to go to qualifying in Abu Dhabi last year and it was amazing. I went to the Singapore GP last week and that was my first GP, absolutely amazing!! You will love it!!! TBH the V6's actually sound alright in real life and NOTHING beats the atmosphere of being there! Got back late Sunday night from the GP. It was amazing! I sat in my seat with a giant smile on my face the entire time. Forget that it was a boring race. It wasn't boring sitting there watching them go down the start/finish straight. Oh, and they sound great (except the Honda, it sounds sickly). And the elevation change from the chicane down to corner one is massive! It's so steep. It was great getting to see all of it. All of my pictures are on my phone (I was travelling light so that I could get back to Tokyo at a decent time as I had to teach first thing Monday morning) but I'll see if I can get them up somewhere. Not sure I can get them to post (or if they are any good in the first place). Just FYI, in case you plan to use the shuttle service from the Convention Center to COTA, it's two-tiered this year: $10 per person for standard service, $25 per person for 'Express' service. The "Express' bus drops you off by the Grand Plaza. The 'Standard' bus drops you off out in the boonies, a 30+ minute walk away from the Grand Plaza entrance (about twice as far as the long walk to Lot F). God help you if you take the Standard bus and your seats are anywhere but T12 or 15. You're looking at a very long walk. IIRC, last year the $10 tickets were available throughout the weekend at the Convention Center. Not so this year. If you want Shuttle service this year and you wait beyond the 18th to purchase it, you'll be left with no choice but to buy the more expensive $25 per person Express option. 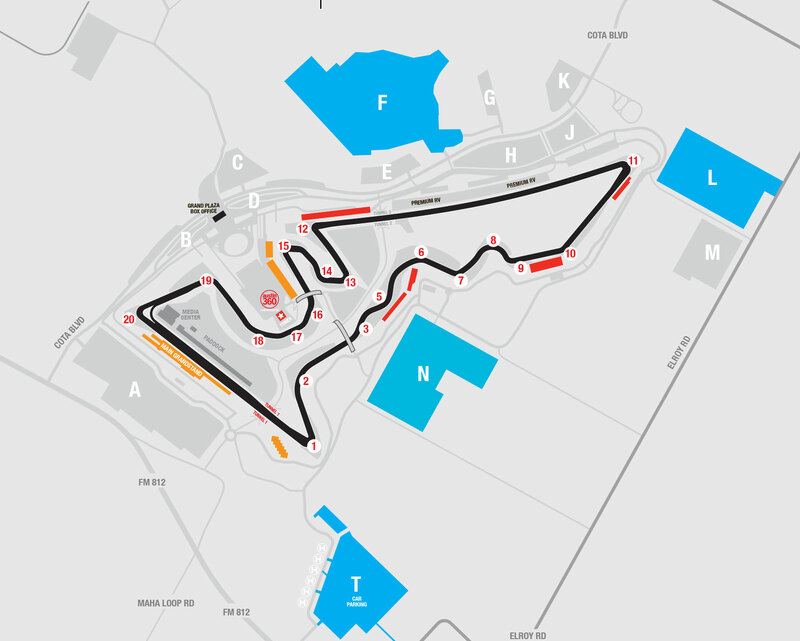 Vance has written up a nice piece covering all the shuttle and parking options for this year's USGP, with links to various COTA pages on the topic. If you opt for the $10 Standard shuttle, you'll be dropped off at the McAngus Road shuttle lot (the unmarked gray shape in the top left corner of this map). The shuttle options bear repeating, in case anyone missed it who wants to ride the convention center shuttle. Today is the Deadline to buy $10 Standard #USGP Shuttle tickets!! After today, only the $25 Express Shuttle will be available. If anyone wants to go Friday or Saturday only, Stubhub has Friday tickets starting at $6 and Saturday starting at $50. Hi. I'm taking my wife and kids to Hockenhiem next year. We're staying in Heidelberg. Does anyone have any tips or interesting information on the area? Some notes on my experience at the 2015 Brazil Grand Prix at Interlagos. Much, much better than expected. I stayed in the Jardins area of Sao Paulo and would recommend this area as the best area to stay for the race. It is very upscale and safe to walk around at night. The very big upside is that Sao Paulo has one of the best subway systems I have used. Getting to Interlagos from Jardins is easy on the subway which connects to rail to the Interlagos stop. All connections are inside and the cost was 3.50 BRL, about 1 USD oneway. When you arrive at the Interlagos station you will walk about 10 minutes to the track. There were signs pointing the way and lots of other race fans walking from the Interlagos station on Saturday and Sunday- so although the surrounding area is dodgy, the walk is quite safe. Policemen are posted and on horseback all over. I will admit Friday had fewer fans and no signs pointing to the track- and hardly any police. But we followed a few Red Bull fans and easily and safely arrived. The track: My wife and I purchased tickets in Grandstand M and were pleasantly surprised with overhead cover in case of rain and dedicated seats with numbers. This is key to avoid having 16 fans sitting on a bench for 15 spaces. The dedicated seats eliminates people who do not belong. There were downsides at Interlagos. Once you enter Grandstand M ( and every other grandstand to my knowledge) you are contained in the Grandstand M area and cannot walk around the perimeter of the track. I did not like this. They did have merchandise stands and food/drink stands in Grandstand M, very similar to the interior of American sports stadiums. Also the big screen TV was not that large, but we were directly across from the pits and could see many passes in the curve at the end of the start/finish line. My biggest thrill was walking past Alonso near the business class lounges at the GRU airport. I could have asked him for an autograph or pestered him, because the area was secluded, but I chose to leave him in peace. Just a great city and a great race experience. I'm going to Spa this year. Have pretty much decided which grandstand ticket we're going to get, but I just have one quick question: if we buy a 3 day grandstand ticket, would that allow us to go and sit in ANY grandstand on the Friday and Saturday? I think that is how it works at some other tracks and is obviously good as you get to see a range of bits of the track. Hello everyone, looking for some help choosing a seat at this years race. I have previously sat in grandstand 24. I am looking for either grandstand 11 or 12 this time around. I think I'm leaning towards #12. I was doing a bit of reading and understand that not all seats have good lines of sight however. I was hoping someone could tell me the best area to sit in. From the photos I saw it seems the far left side of #12 above the midway point looks good. Also the far right side of #11 also seems like it has a good view of all the action in that area. Was hoping someone who has actually sat in these sections could confirm this or suggest a better section to sit in? Also, are the trio pkgs worth it or do they stick you in the worst seats in those sections? The Senna trio pkg has Friday in #15, Saturday in #1 and Sunday in #12. I know 15 is very far from the track. Sitting in #1 during qualifying seems like a bit of a waste as well considering the cars don't line up on the grid and hide in the garages in the pit lane. Am I crazy in these thoughts? I'm going to my 20th Aust GP in a few weeks. But for the 1st time in the paddock club.!! Has anyone been b4 in the paddock club, dress code, do's / don'ts, hints tips to get the best out of it...? Hi all. I'm looking to attend the one of the two day tests at Silverstone in July, but have never been before. I was wondering if anyone could give some advice and tips please? I work for a Sports Tour Company (www.bacsport.com) and we offer tailor made packages to different events around the world (Mainly F1!) I'm just positing on here one of our fantastic offers we have available for the British GP this year! and an experience you will never forget!! Post subject: Going to the Belgian Grand Prix - Any ideas? Not the most active member here but wondering if anybody had some helpful ideas! Myself and 2 mates are going to Belgium to watch the race. We are driving, via the tunnel and will probably stop off in brussels on the way. We are camping in the 17-27 area (booked on BookF1.com) and was just wondering if anyone else has been here and has any ideas as to what to do during the evenings etc or handy hints or tips for us. Thursday evening we will probably spend setting up our tents and so on, Saturday will be the main festival evening so on Friday evening we would like to drive out a bit into the nearest town/city. Has anyone got some recommendations? Post subject: Re: Going to the Belgian Grand Prix - Any ideas? I drove there in 2011 from London, we arrived Friday night at around 11pm and just parked up and pitched, never ended up paying for camping at all. There is lots going on, a few pubs a few tents set up by crazy German techno fans. Small towns surround the track, we were closest to turn 1 Le source but still a 30 minute walk away. The track is very large so different parts of it are in different towns so I can only speak of things around this area. It can be very roudy - arm wrestling contests etc - it is 99% blokes around the bars and stuff. Spa is a nice place to hang out of an evening, but for a selection of nice bars/cafes and less people, Malmedy is wonderful and very close. Stavelot is OK but a little lacking in nightlife. Check the opening times though because there is a nice car museum in the basement of a castle in Stavelot. Got some lovely race cars to look at as well as other cars and motorbikes. To those attending any race, have you been ever tempted to go to the PA system (in bar, or any place surrounding the F1 event), take up the mic, and ask the crowd, "Is there any Planet F1 forum member overr here? Please, come over." It would be very revealing to see that behind those strong names we see every day, are just the people with blood and bones, like everybody else. And to have a chat, of course. You might as well take the punt. You'll get to see the likes of a Lewis Hamilton win a Grand Prix, which would be a privilege. My best memories are being above the stretch between Rivage and the double Pouhon corners, or on the approach to the braking area for the bus stop in the cheap ticket class, and of being in the grandstand at the Raidillon, where we could see that the commentators accusing Zanardi of making a driving error for his massive crash were simply talking out of their behinds. That was in the most expensive ticket class, of course. Overall, I think the tickets are far too expensive for what you get to see. hi guys, im thinking about attending this years spa gp. Id like to buy a bronze general admission ticket as it's what i can afford at the moment. i'd like to know peoples experiences of attending as a general admission at the belgian gp? Il be staying in brussels city centre and making the hour 30 min journey by train for qualy and race day. its my first gp attending. Id like to know if fold out chairs can be bought nearer to the location? Hi I went to Belgium last year as part of a package and the tickets were general admission. We were sat on the kemmel straight majority of sat and sunday. Get to see the cars come out of eau rouge and there was a lot of overtaking. You don't really need a seat here unless sat at very back as it's on a grass slope. One word of advice is it's a very hilly climb to this area and bring suncream! There also was a couple of drink/food stalls up there. Can't offer much more advice as never ventured further! Be wary of Brussels it's a nice city but there wasn't many about at night time and I found people outside the hotel to be quite unfriendly; just my own opinion/experience tho!